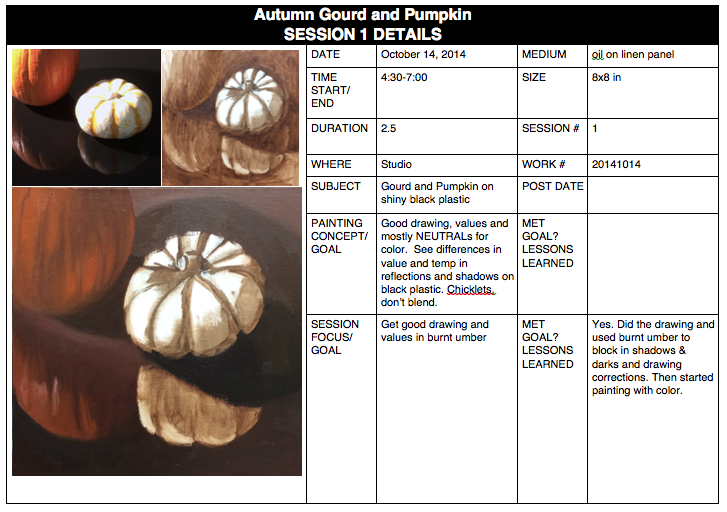 What an interesting painting challenge this was: strong warm light on a white gourd and a small pumpkin, with reflections and shadows on a shiny black plexiglass surface. Below are the steps as I worked on this painting (available for purchase on my DailyPaintworks gallery). As usual there was one session where I did some “unauthorized painting” (see previous post for explanation) so the next session was all about trying to restore those areas. I’m trying to learn when to preserve the freshness of the “alla prima” first attempt and when to rework it. To see notes about each step and misstep, here is the link (PDF) to the Session Chart at the bottom of the post. To see notes about each step and misstep, here is the link to the PDF Session Chart pictured above. Have you downloaded a Session Chart? Do you find it interesting enough for me to keep uploading them? Do you prefer just seeing the work in progress steps without detailed commentary? Thanks for visiting! Great idea with the black glass, I may have to try that.